« Skills? Check. Now What? A re-post for “Getting Started” week. It was so great to hear from all of the people who agree with the importance of meeting children where they are. This is something that seems so basic and obvious yet can get overlooked when fear and frustration take over. So, while it is important to meet them where they are, how do we know “where” they are? I have spent a good deal of time trying to find resources to make it easy for people to do this and there isn’t a whole lot out there that is useful for parents. All I could find was the “Your child is __. A __ -year old should be doing this.” These were not helpful at all because I had a __-year old and they were not doing what they were “supposed” to be doing. 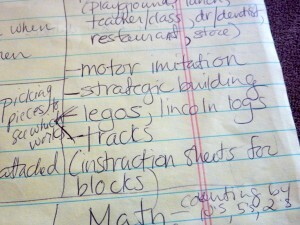 I needed to know where my child was with regards to individual skills so I could figure out how to move him along. Four years ago I began working with a student in the school of education who is now teaching early childhood students at a local school. She happened to be taking a graduate class on child development when I mentioned to her how hard it was to find timelines with specific skills so I would know where to start with Andrew. She went home, went through her course handouts and found these fabulous timelines that were exactly what I needed. I loved them (and still do!) because they listed out the general skill area and broke down the skill’s progression from birth to around 6 years. While the sources are documented, I went online and could not find the originals or the textbook that they were from, (very disappointing!) but what mattered was that I found something I could use to figure out where I needed to start. My husband and I sat down with these timelines and with some very honest consideration, marked the skills that he could absolutely do independently and knew that the next part of the skill was where we needed to place our focus. Important to note: While there were ages marked next to the skill, we realized that they didn’t matter. What mattered was that he was where he was and if we were going to help him progress, than that was where we needed to meet him. I also have a version on my website under Developmental Timelines that gives an example of how I look at a certain skill with Andrew to determine where we need to start. I removed the ages and turned it into a survey so I can help provide people with activities to build specific skills. 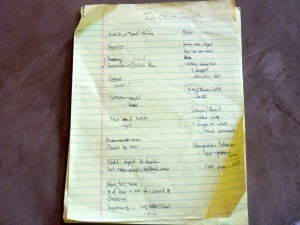 Our actual notes from going through the timeline, dated June '08 with review in Jan. '09. 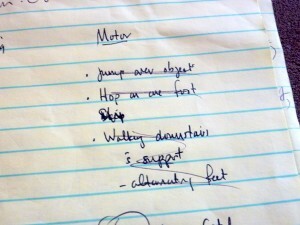 Notes up close showing skills we were focusing on and crossed out when we reviewed them 6 months later - progress! 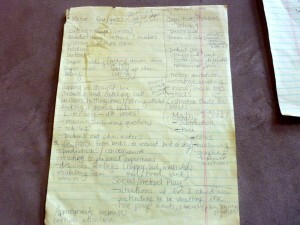 We wrote down the different skills and that was when I got busy brainstorming. I would think of the skill, think of materials or toys that we had that could help build this skill and create a quick and basic activity station so we could work on it. At first glance, My Obstacle Courses in our house may look like a mish-mosh of activities but if you look closely, you will see that each station is focused on building a developmental or academic skill, usually with a thematic twist. My brainstorming notes for each area. It is really cool doing My Obstacle Courses with Andrew because the stations are always designed to be working on skills at the level he is ready for and he is so engaged! When I first began doing this it was such a great feeling and further reinforced the importance of starting where he was. I was helping him build the foundation instead of tossing skills at him that he wasn’t ready for. This is when we really began to see progress and it felt amazing!